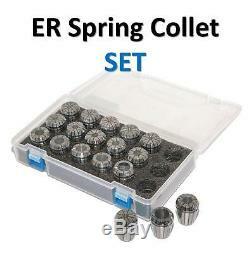 ER CNC Collet Chuck Spring Collet Chuck for Milling Machine SET - Comes in a plastic Set box. 1, Material: 65Mn 2, Hardness: HRC46-50; 3, Precision: Standard - 0.015mm or High Precision 0.005mm 4, Collet inner hole, groove, end and the cylindrical are grinding many times, can reach Ra0.4. 5, collet groove use grinding process, suitable for high speed machining. 6, Two looks provide:polishing and chemical nickel-plating processing. 7, Cleanness better, Accuracy stable, Surface more smooth, Feel comfortable, Appearance nice. EPacket - ONLY 10-20 days from Honk Kong. SET - ER Spring Collet High Precision CNC Chuck Mill Top Quality Tool Machine. Available to the following countries: (for countries that are not in the list, we will use China post 15-35 days). United Kingdom, United States, Australia, Russia, Canada, France, Saudi Arabia, Ukraine, Norway, Israel, Germany, Hong Kong, Korea, Malaysia, Singapore, Austria, Belgium, Switzerland, Denmark, Hungary, Italy, Luxembourg, New Zealand, Poland, Sweden, Turkey, Finland, Ireland, Portugal, Brazil, Netherlands, Mexico, Japan, Spain, Thailand, Vietnam, Greece. Polished Carbide Inserts for Aluminium. Carbide inserts for Steel process. EPacket - ONLY 10-20 days from Hong Kong. In very rare occasions it take up to 60 days. The item "SET ER Spring Collet High Precision CNC Chuck Mill Top Quality Tool Machine" is in sale since Thursday, January 17, 2019. This item is in the category "Business & Industrial\CNC, Metalworking & Manufacturing\Welding & Soldering Equipment\Welding\Welding Protective Gear\Other Welding Protective Gear". The seller is "99_men" and is located in Hong Kong. This item can be shipped to United States, all countries in Europe, Canada, Mexico, Japan, Brazil, Australia.